Last year’s unrelenting rains apparently killed off significant numbers of Maryland oysters in parts of the Chesapeake Bay watershed and generally impaired their reproduction — but the deluge helped survivors fend off disease. Preliminary results from last fall’s annual oyster survey by the state Department of Natural Resources found high freshwater-related mortalities in the upper Potomac River and to a lesser extent in the Upper Bay. The survey also found that the number of new oysters produced last year fell below the long-term average. DNR officials briefed the department’s Oyster Advisory CommissionMonday on the survey, which regularly canvasses more than 250 oyster “bars” or reefs around the Bay and in its rivers and creeks. A crew tows a dredge across each bar and tallies the number of live and dead oysters recovered, measures the survivors and checks for tiny “spat” or baby oysters. The survey also sends a random selection of bivalves to the state-federal laboratory in Oxford, MD, to be examined for diseases. Chris Judy, chief of the DNR’s shellfish division, said the die-offs and poor reproduction are a result of heavy rains turning the Bay’s semi-salty water much fresher than normal. Oysters tend not to reproduce well in fresher water, and it can even kill them in extreme cases. Last year’s weather was extremely wet. Heavier than normal rains from May through November produced the highest river and stream flows recorded in 34 years, Judy said, pushing unusual amounts of fresh water into the Bay. With stream-flow still elevated, Judy said die-offs may continue, and he noted that watermen have reported finding more dead oysters after the survey ended around Thanksgiving. The survey crew found no spat at all in most of the Bay and several of its tributaries, Judy said. 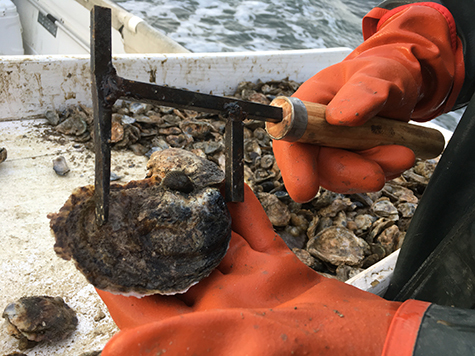 But there were some bright spots, with relatively high numbers of juvenile oysters found on reefs in the Manokin River and Tangier Sound on the lower Eastern Shore. The crew also saw decent numbers of spat in upper Broad Creek near the mouth of the Choptank River, traditionally a good spot for oyster reproduction. The reduced salinity of Bay water apparently suppressed at least one of the two diseases blamed for repeatedly ravaging the Bay’s oyster population since the late 1980s. The 2018 survey found the prevalence, or percentage, of oysters with Dermo at its second lowest level in the last 29 years, and its intensity tied for the lowest level recorded since those tallies began around 1990. Back in 2002, Judy said, the DNR survey crew found almost 60 percent of the oysters had died of Dermo or the other disease, MSX. The 2018 survey tallied only a 14 percent Dermo-related mortality rate — well below the long-term average. “If there’s any good news from the rain, disease declined,” Judy said. The lab is still checking the MSX data, Judy said, but that is expected to be low as well. In addition to the good news about suppressed disease, the survey found that the “biomass” of oysters — a combination of their number and size — had rebounded a bit last year after a four-year decline. The uptick in biomass also could be related to the freshwater influx, Judy suggested. Spat counts tallied in 2015 and 2016 were slightly above average, and those oysters normally would have reached market size by last year. But the 2018 freshwater surge likely impeded their growth, Judy said. That could give a little help to the commercial harvest, which after reaching a recent peak of 400,000 bushels in 2014 has declined each year since. Last season’s harvest was about 180,000 bushels, the DNR has said. The DNR is in the process of drafting a new legislatively mandated plan for managing the state’s oyster fishery, which has not been updated since 2004. The department recently completed a scientific stock assessment that found the population of market-size oysters was about half of what it had been in 1999, and that they were overharvested in a little more than half of the areas examined. Dave Blazer, the DNR’s fisheries director, said the draft plan would be made public soon, after which the department would take comments on it for 30 days. Once finalized, it will serve as the framework for regulating commercial harvests of oysters in the state.